Testpage – Behavior Education Services Team – provider of ABA services & family support! Instructions to the Vendor: Section 4686.31 of the Welfare and Institutions Code requires any vendor who provides Behavioral Services as specified in Title 17 of the California Code of Regulations· to submit a completed verification form to the regional center for services provided to consumers under the age of 18 years who reside in the family home. The vendor must submit the completed verifications to the regional center with the invoices for the services provided. If the parents or legally appointed guardians of a minor consumer do not submit a verification of services to the vendor, the vendor shall contact the regional center. Failure of the parents or legally appointed guardians of a minor consumer to submit a verification of services to the vendor shall not be a basis for terminating or changing behavioral services to the minor consumer. 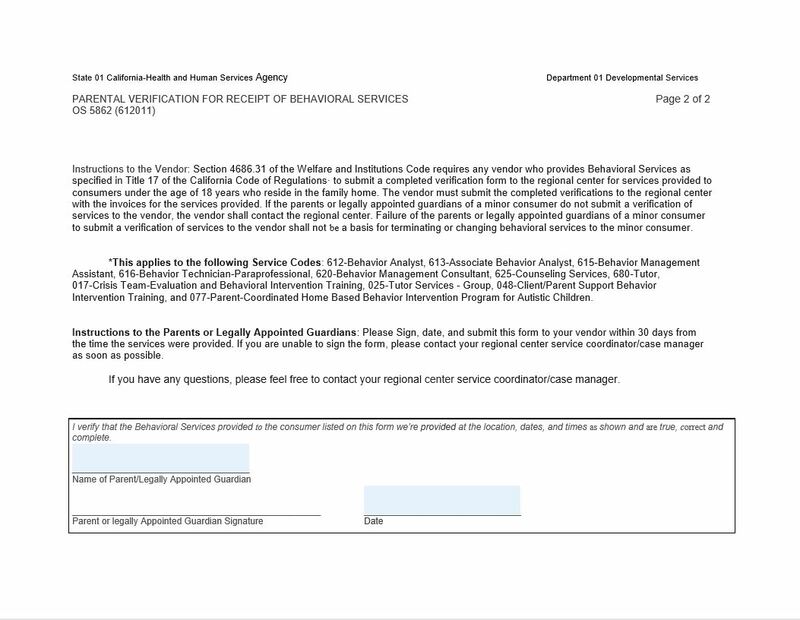 *This applies to the following Service Codes: 612-Behavior Analyst, 613-Associate Behavior Analyst, 615-Behavior Management Assistant, 616-Behavior Technician-Paraprofessional, 620-Behavior Management Consultant, 625-Counseling Services, 680-Tutor, 017-Crisis Team-Evaluation and Behavioral Intervention Training, 025-Tutor Services - Group, 048-Client/Parent Support Behavior Intervention Training, and 077-Parent-Coordinated Home Based Behavior Intervention Program for Autistic Children. 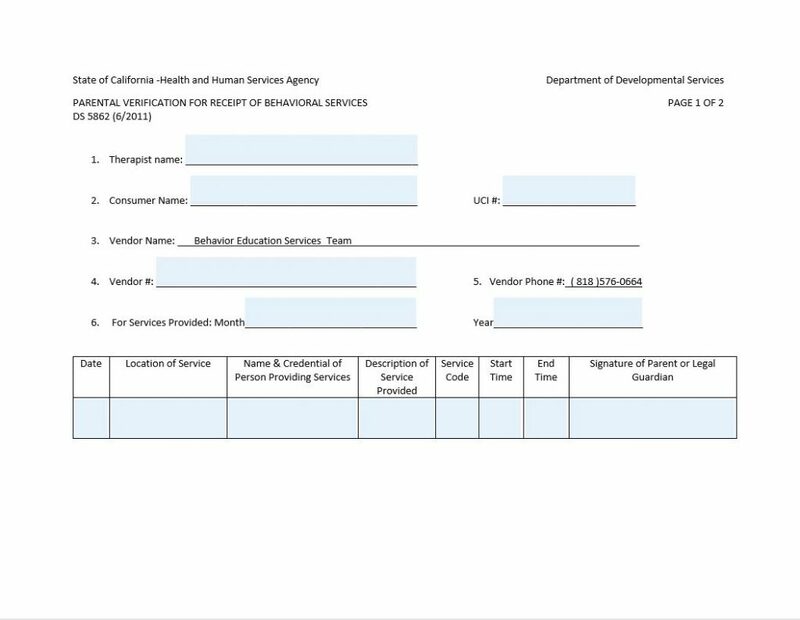 Instructions to the Parents or Legally Appointed Guardians: Please Sign, date, and submit this form to your vendor within 30 days from the time the services were provided. If you are unable to sign the form, please contact your regional center service coordinator/case manager as soon as possible. If you have any questions, please feel free to contact your regional center service coordinator/case manager.